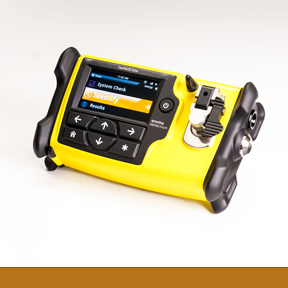 The HazMatID Elite is a portable chemical identifier used to detect hazardous chemical and biological substances. Military and civilian first responders use it to quickly and accurately detect health and safety risks in the field. In one minute or less, the HazMatID Elite identifies and categorizes thousands of possible chemical warfare agents, explosives, toxic industrial chemicals, narcotics and suspicious powders. Designed by Rob Tannen, Ph.D., Jim Monzo, Matthew Thomas and Keith Fraser of Bresslergroup; Doug Winner, Gene McGraw, John Pelosi, Jim Frey and John Laverack of Nexus Design LLC; Product Manager: Dustin Levy, Project Manager: Kyle Oberndorfer, Head Software Engineer: Eric Zuidema, Head Electrical Engineer: Len Cardillo, Head Mechanical Engineer: Walter Perec, Head Firmware Engineer: Paul Hetherington, Head Application Scientist: Michael Frunzi, Head System Engineer: John Stein, Manufacturing Engineering Lead: Javier Santiago, Quality Assurance Lead: Joy Davis, Technical Support Lead: Pete Curulla and Technology/Domain Expert: Terry Sauer of Smiths Detection Inc. for Smiths Detection Inc.